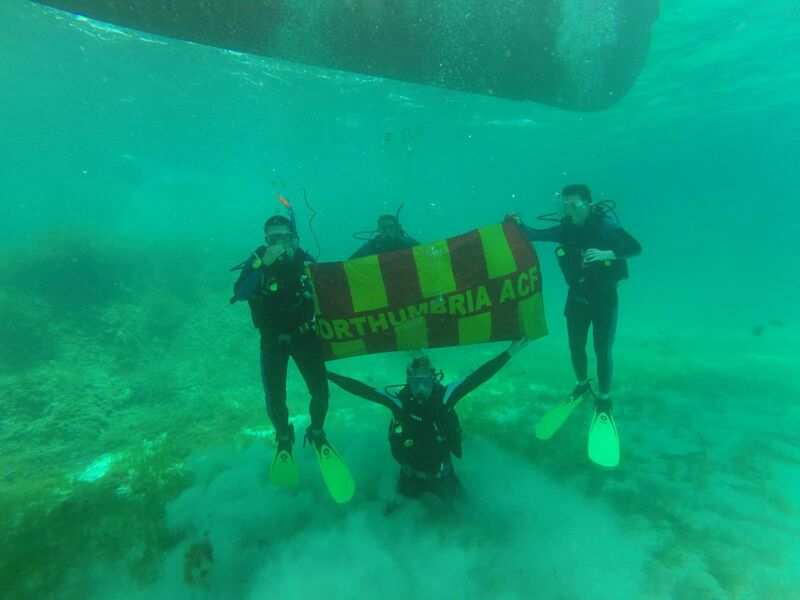 Exercise Polypus Venturer 2 was a sub aqua expedition to Gozo, Malta from the 5th to the 12th July 2014 and was formed from 9 Cadets and 3 Adults of Northumbria Army Cadet Force. Of these 8 of the cadets were new to diving. The primary aim of the expedition was to qualify the non-divers to PADI Open Water standard and provide progressive training and diver experience for the others in order to encourage them to attract others to experience the sport. A secondary aim was to develop in the cadets an understanding of the ecological issues facing the aquatic life and land area of Gozo. The expedition was open to all cadets and adults in Northumbria ACF. This year’s expedition has seen the largest number attending to date. The expedition participants needed to cover all costs through a combination of grants and personal contribution. Each individual paid £400 for transport, accommodation, a dive package with full equipment hire, instruction, learning materials and certification cards. In addition Individuals booked their own flights with Easy Jet from Newcastle to Gozo. The average cost of the flights was around £250-£290 per person depending on when booked. The funding from the Ulysses Trust was essential in enabling the cadets to be able to afford the cost of the exercise and the Trustees are thanked for their generous support without which a number of the cadets would not have been able to afford to attend. The flights to and from Gozo were uneventful and went according to the timetable. Transport on the island was provided by Scuba Kings, with dive parties transported to sites in the centre by vehicles, either Toyota High Lux or a Maruti Jeep. The Maruti was also available to the group so they could sight see the island in the evening and on their day off. The accommodation was provided by Scuba Kings at Qbajjar on the Triq Santa Marija, these were self-catering with separate facilities for Adults and Cadets, male and female. The accommodation was of a high standard and there were no issues reported. Prior to deployment the non-divers, of which there were 8, attended an introductory session at Deep Blue Pirates in Whitley Bay with Lt Pugh as the instructor, however the actual classroom, confined and open water sessions were conducted by the Scuba Kings instructors in Gozo. Over the first few days the cadets concentrated on their academic studies and learning the basic skills of scuba diving such as controlling buoyance, learning how to flood and clear their masks, looking at the effects of pressure and its relationship to breathing underwater. Once these were completed and mastered they moved on to deeper and more interesting dives, including the delights of playing with octopus and sitting in a cloud of hundreds of fish as they dart back and forth. 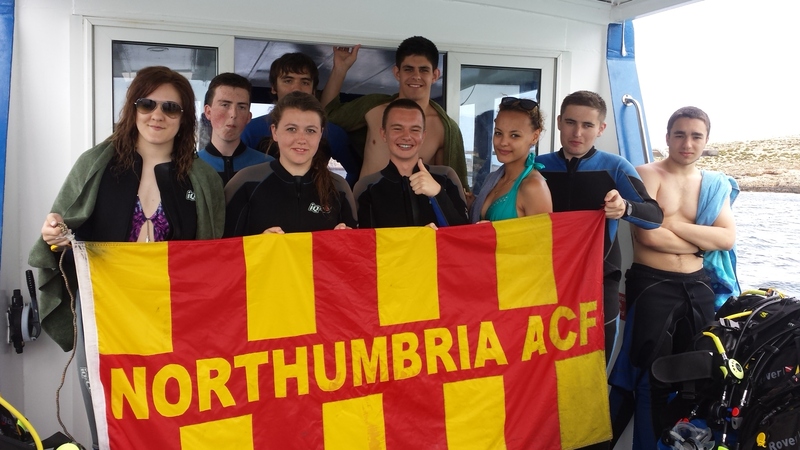 All told the cadets undertook eleven dives including one day from a boat and two from Comino. 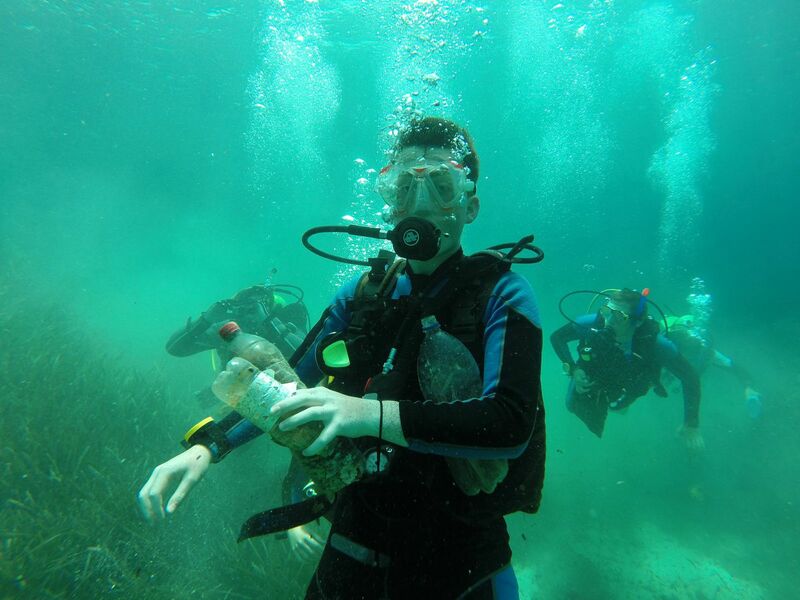 During the week several discussions on environmental issues were conducted with the cadets, this culminated on the second boat dive where the cadets took mesh bags on the dive in order to collect rubbish on the seabed. Prior to the dive and looking just from the boat the small bay seemed idyllic, the sun was shining, there was a light cooling breeze and tourists could be seen on the shore enjoying the area. The cadets had also seen boats full of tourists on the other side of the island so clearly this beauty spot was very popular with visitors and sightseers. However once underwater it quickly became apparent that the area was not so idyllic with a myriad of plastic and glass bottle or containers scattered across the seabed. The cadets spent the 40 minute dive scanning the area and recovering some of the rubbish in the immediate area (please see pics at the end of this report). Comments were made by the cadets regarding the effects on sea life, the spoiled beauty and how it was just sheer laziness on the part of individuals that was causing the problem. The rubbish was disposed of properly when we got back to shore. Ex Polypus Venturer 2 was a thoroughly enjoyable exercise, there were no discipline issues with either cadets or adults and the feedback from Scuba Kings indicated that all were attentive, courteous and had a willingness to learn. Special thanks must go to Richie King the owner of Scuba Kings and his team of instructors who provided and facilitated safe, educational, and wholly enjoyable week for Northumbria ACF. The Cadets would also like to thank the Ulysses Trust for their kind donation and support they have given to this and other ACF expeditions.